The kitchen in our hacienda. Welcome to this website informing you of many adventures available to you in the Cayo District, of Western Belize. There are many local tour operators, small hotels, jungle lodges and foothill rental cottages, or cabins,offering tours and adventures in Western Belize. There are lots of people into adventure tours and eco-tourism, with vegetarian restaurants and all that stuff. The downtown area of Santa Elena, and San Ignacio, two twin small foothill Mountain and agriculture tourist towns, straddle the end of the Macal River coming out of the Belize Alps. Altitude is about 400 feet above sea level. Rolling hills in a valley that controls access in the old Mayan Empire days, between the interior of the Peten of Guatemala and out to the Caribbean Sea a hundred miles away. This valley has funneled trade since the last ICE AGE, for humans archeological digs confirm. Locals were eating the extinct GIANT SLOTH back in the ICE AGE. The surrounding hills have hilltop Mayan ruin complexes; sort of like the Khyber Pass forts between Afghanistan and Pakistan. The best hilltop Mayan Ruins are Xunantanich and Cahel Pech. These hilltop temple pyramid ruins are older than the Roman Empire, or the previous Greek Empire of Europe. There are lots of Mayan ruins in our area in Western Belize. Around the twin towns of San Ignacio and Santa Elena, you will find a lot of small tour operators offering trips to many different sites and other adventures. Little wood shacks with tour signs, to big operators with hotels, have signs on the street sides, offering trips to anywhere and everywhere locally. Shop around and get the best price. You can range in price and facility from the deluxe to the funky in tour trips. Everything is in walking distance and you can shop for souvenirs, crafts, or different styles of eating, from local campesino and vaquero cafes, to deluxe hotel service. Even vegetarian restaurants, Chinese food, Indian food from Asia and more. The hotels from the fancy to the primitive are all still considerably expensive in the immediate downtown area. But there are better bargains to be found like cabins and campgrounds, a short distance away, that often will more than cover the taxi fare in savings with better quality and a lower price. You can ask at the local tourist office in the center of the town. Most taxi drivers should be able to advise you on prices and places to stay. Local tour operators offer trips to the Che Chem Ha caverns, canoing through the Barton Creek Caves that has a section with pottery and Mayan skeletons that are 3000 years old. You can travel through Mennonite farming country and to Butterfly Farms. A number of waterfalls are offered as attractions. There is the Big Rock Waterfall and swimming pool, the Five Sisters waterfall, the Blue Hole waterfall and swimming archeological park, also the Vaca Falls on the Macal river. 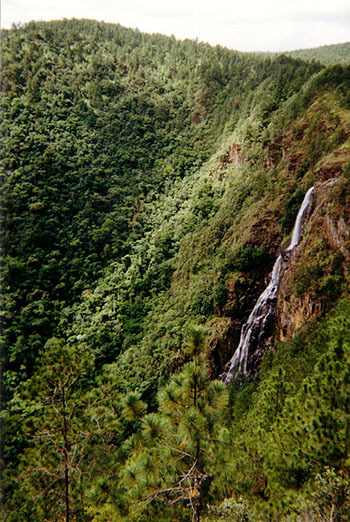 And of course the Hidden Valley Falls a 1600 ft drop up in the Mountain Pine Ridge on the north side of the Belize Alps. 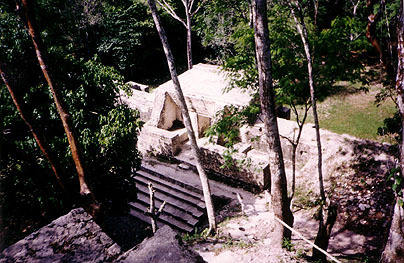 For other ruins, we have El Pilar, Caracol and a growing number of newly discovered underworld Mayan cave exploring sites. Caracol is much further away over three mountain ranges in the southern jungles, a long trip. Though occupied for about 1400 years, the importance of Caracol is that; in the mid Mayan Empire Feudal days, Caracol conquered the rest of the Mayan Empire and ruled for about 400 years out of Belize. The temple is the highest in Belize, about 140 feet. It is a fascinating story. There are a number of competing canoing operators, that do the lower Macal River and gorge. Even tubing is done on some lower stretches of this river coming out of the Belize Alps. Several jungle and ranch operations offer accomodations and horseback eco-tour riding trips. There are over a 150 riding horses for tourism on ranches available in the area. For people into jungle herbal medicines, there is the Panti Medicine man alternative medicinal plant trail. A tour of jungle plants useful for medicines. Phylis Dart over at EKTUN LODGE on the gorge wall surrounded by jungle, of the steep Macal River Gorge, has numerous jungle trails and knows her medicinal plants also. One lodge outfit is into archery into a big way and if you like bows and arrows, offers some serious equipment and target shooting. Ian Anderson, still in the Cayo District, but over in the Hummingbird Gap and some distance away from Western Belize here, is famous for an ADVENTURE trip that includes rapelling into a 300 feet deep sink hole, and having lunch when you get to the bottom and introducing you to the surrounding rare ecological niche bottom, of the flora and fauna of this spot of rare jungle trees and plants. We ourselves, are trying to build a small village of various artists and are promoting the first ever MAYA MOUNTAIN FOLK MUSIC FESTIVAL IN THE AREA. ( donations for prizes welcome ) There are a few MAYAN INDIAN MARIMBA BANDS that play in the Indian villages and some Boom and Shine makeshift instrument bands. Slate carving is common of Mayan writings and decorations. Wood carving is popular also. There are some jewellers who make custom stuff out of local materials and rare mountain rocks. The funky campesino cafes offer real meal bargains, in price and quantity, as they cater to the local agricultural community. Saturday morning market day is the biggest in the small country of Belize and this market sits along the steep picturesque banks of the Macal River between the two towns. On hot days we swim here in the shallows ourselves and cool off, as do a hundred locals and kids also. This is the local popular swimming hole of childhood memories. We have plans to construct a permanent campground in the Belize Alps for hang gliders, sailplanes and paragliding with ultra-lights. There are a beautiful series of pine clad ridges for soaring to be enjoyed and thermals abound on your average day. Our mountain ridges are about 3200 feet in altitude and you have beautiful natural vistas across the Maya Mountains. We have not yet explored a Northern approach to the highest peak in Belize, called Victoria Peak from the Belize Alps pine clad mountain ranges. But hope to get to it this year? This will be a real adventure, traversing mountain ranges and jungles and rivers. The bird flying distance is about 20 miles, but by foot we don't know? Nobody has done it yet! You can see the peak off in the distance easily. But getting there and building a hiking trail with shelters are still for the future! The Belize Alps are about 70 miles away from the twin towns and hostel, over rough remote logging roads. Belize is still pioneer country, though many of the Lodges are very deluxe and expensive in remote locations. Many of them are owned by Hollywood movie stars and movie directors. I guess they like the ambience of nature and nobody around here would recognize a Hollywood movie star anyway; so they enjoy being a normal person on the streets and byways. FALCONVIEW BACK PACK HOSTEL in Western Belize. $9 USA per night, plus tax. Canoing the Macal River and the Mopan River. Day trip to the Mayan Pyramid ruins of Xunantanich and Cahel Pech. Camping and hiking trips into the Belize Alps. CLICK HERE for INFO! This area of Western Belize is hilly and mountainous. There are lots of ranches, lodges, and adventure tourist destinations. Plenty of Mayan ruins, both excavated and unexcavated. Humans have lived here in this valley entrance into the Peten jungles of Guatemala since the last Ice Age, as archeological research digs show. Back 35 years ago, these two small country towns were full of bars and dance halls, catering to the mule trains and chicleros cutting the gum out of Sapodilla trees in the jungles. The mercenaries passing through to Central American civil wars, and contraband smugglers galore, with illegal Mayan stelea and other artifact smuggling and parrots for the California bird trade. The nefarious and eccentric are still found on a weekend at your local restaurants. The stores back then, were hardware stores, with saddles, shotguns, pots and pans and kerosene stoves for the ranching crowd. Today, the towns are growing ( about 14,000 population serving a 120,000 pop. area). Colorful Amish Mennonites with their horse and buggies, sell watermelons and mahogany home made furniture at the local market and even have a couple of their own furniture retail cubby holes in town. Agriculture is still the mainstay and tourism slowly growing. You can buy a washing machine from the Hindu shops today, or a television. The small downtown area is a small funky laid back tourist area over a few tiny blocks and side streets, with some quite good cosmopolitan restaurants and lots of 'hole in the wall' type local tour operators offering adventures. In the surrounding foothills today in 2004, you will find a fair number of private residences and ranches, lodges and hotels for the expat crowd. Mostly USA citizens. While there might be a dozen of the retired person variety living on fixed incomes, the larger part of the tourist operations are expensive. The clientele and ownership are primarily the RICH and FAMOUS. Hollywood movie stars, movie directors and others of the famous and well heeled crowd from Hollywood, along with a sprinkling of multi-millionaires and the occasional billionaire industrialist. Some of these places advertise for guests, but don't really want any. They are sort of rich persons retreats used for family, friends and guests. But once the lawyers and accountants get into the act, they tell these RICH and FAMOUS owners, they have to advertise and operate their hideaways as a commercial operation to claim the TAX DEDUCTIONS. If you know your history of the Rich and Famous. You will remember the laid back Pacific Coastal town in Mexico of Puerto Vallejerta. Back in the 1970's it was a favorite hideway of the holiday crowd and rich and famous. Until the paparratzi got wind of it and started writing magzazine articles and otherwise give the place big publicity. The movie stars have long gone from Puerto Vallejerta now. They are over here at the latest in-spot for the RICH and FAMOUS, which is Western Belize. This is a place where you can come into town, have a beer, wear ragged jeans and cowboy boots, get your groceries and nobody gives a rat's as-- who, or what you are. Nobody cares! The rich like that! They can be local small town folks without any hassle. It will all change of course! Take about another 25 years, but Western Belize is still a little known country and adventure paradise. The watering holes are getting better, more restaurants, but still no outside world penetrating this hideway. People coming here and buying property don't want the outside world coming into their lives. You wouldn't recognize Harrison Ford, or Francis Cupola, or Raquel Welch if they were one table over in the same restaurant and they like it that way. No social climbers, or status crowd are desired in this Western Belize. We are small town home folks and would like to keep it that way. For canoeing and floating the rapids of the Mopan River contact Maya Mystic Tours. For adventures, ruins and Belize Alps trips contact Pacz Tours. Both are on the internet. 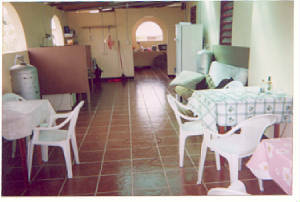 CLICK HERE for Western Belize Low budget accomodations. Falconview Tourist Backpackers Adventure Hostel offers beds and camp sites if you have a tent. Leave the Western Highway in Santa Elena Town at EXIT 66 1/2. CLICK HERE to go to photos and prices of small Tour Operators serving Western Belize adventures, expeditions and Mayan ruins trips.